Here are facts about digital media use. Children today are growing up in a time of highly personalized media use experiences, so parents must develop personalized media use plans for their children. Media plans should take into account each child's age, health, personality, and developmental stage. All children and teens need adequate sleep (8-12 hours, depending on age), physical activity (1 hour), and time away from media. 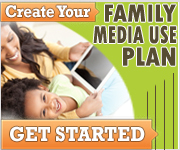 Create your Family Media Use Plan here.